We witness an explosion in the number of applications being developed for mobile devices. Many such applications are in need or generate a lot of Internet traffic, and as such mobile devices are today equipped with more networking capabilities, from mobile broadband (3G/4G) to WiFi, Bluetooth, and others. However, when it comes to mobile broadband Internet access, for economic reasons, today mobile providers tend to switch from unlimited mobile data plans to tiered data pricing models, putting pressure on mobile data subscribers to be more careful how they consume their subscribed traffic. 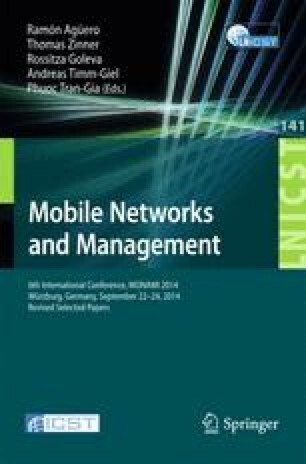 In this paper, we propose OpenMobs, a mean to reduce the costs associated with mobile broadband access to Internet, by sharing under-utilized networking resources among co-located users through free wireless connections. When two or more handsets are in the vicinity of each other, OpenMobs forms an ad hoc mesh network to redirect traffic between mobile data plan subscribers, in the most economic and viable way. We present studies on the feasibility of such a system to minimize the costs users pay monthly to their mobile providers, and even financially compensates users’ willingness to participate in the collaboration. The research is partially supported by COST Action IC1303 AAPELE, and by the national project MobiWay, Project PN-II-PT-PCCA-2013-4-0321.